All visitors to the Club are asked to read the following information. If you have any further questions please contact the Club at bookings@northberwickgolfclub.com or call 01620 895040 . As we are a true championship course the test you will face reflects this. As a result the course is not suitable for inexperienced golfers. All golfers should have a handicap of no more than 24 for gentlemen and 36 for ladies. Please bring a copy of your handicap certificate with you for presentation on demand. The Club does reserve the right to refuse a booking based on ability. We reserve the right to ask golfers on the course to leave if their lack of ability is holding up the pace of play on the course and a full refund of the green fees will be given. A 4-ball playing the West Links should not take more than 3 hours and 59 minutes to play the course. 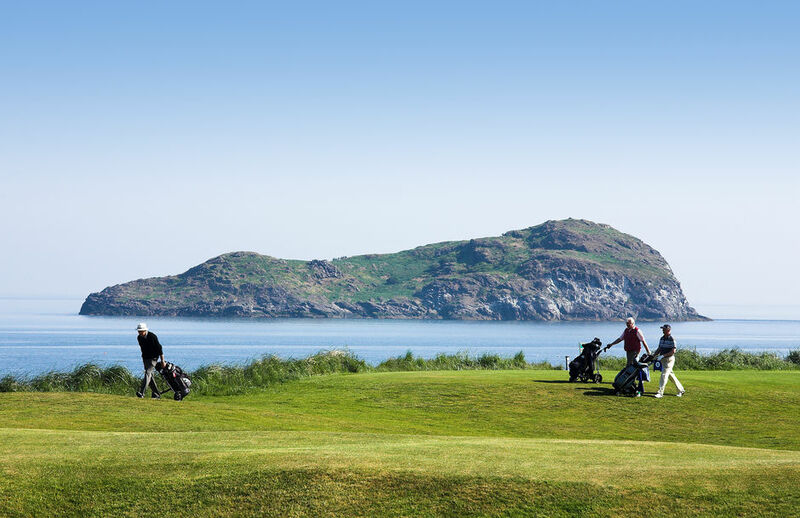 Please click on the link overleaf to request a booking, or email bookings@northberwickgolfclub.com , or call 01620 892135 should you wish to discuss your requirements. A £30.00 per person deposit is required to confirm the booking. This can be paid online and is confirmed by e-mail. The final balance can also be paid online or to the Starters before play. Please note that the deposit is non-refundable and will not be deducted from any final balance in the event fewer players turn up than originally booked for. Deposits will only be refunded in the event the Club has reason to close the course, i.e. adverse weather. If this is the case, if you have completed 9 holes or less you will receive a full refund; if you have completed between 10 and 16 holes you will receive a 50% refund; if completed 17 holes there will be no refund. Please note, for groups of 24 players or more full payment is required 30 days prior to the date of booking. We recommend the final balance be paid online using the link in your confirmation. If paying on the day, please arrive in plenty of time to pay your balance to the Starter before play. We accept Visa (debit and credit) Cards and MasterCard. Please note we do not accept American Express or Diners Club Cards. Cheques (from UK banks) will only be accepted for the payment of the deposit in advance, but not for on the day balance payments. All will be required to present a valid membership card before play. Failure to make a request in advance of the day of play or to produce a valid membership card will result in the full green fee being charged. The terrain of the links is such that buggies are not permitted. Push trolleys are available for hire from the Professionals Shop. There are also a limited number of electric trolleys available for hire. Please contact professional@northberwickgolfclub.com to book an electric trolley. Caddie requests should be made at the time of booking or no later than 14 days prior to the day of play. Any requests or amendments to bookings within 14 days will be subject to availability. At all times we will try to honour caddy requests but this is not always practically possible. The caddie rate for the 2019 season is £50.00 plus gratuity and is paid directly to the caddies at the completion of the round. Our caddies will carry one bag only. Please note that we do not offer a fore caddie service. Titleist hire clubs are available for both gentlemen and ladies, left handed and right handed at a cost of £40.00 per round inclusive of a push trolley. Please book in advance of play to avoid disappointment. Visitors with a handicap of 12 or less are welcome to play from our White Tees on the premise that suitable proof is shown. There are putting and chipping practice facilities adjacent to the 1st tee. Subject to weather conditions there is also a warm up net located by the Professional’s Shop. Formal golfing attire should be worn along with golf shoes. Jeans, track suits and similar are not permitted. We have a relaxed dress policy in the Clubhouse. Smart jeans and training shoes are welcome as much as jacket and tie. Ripped or dirty jeans, track suits and similar, rugby and other sports tops are not permitted. These should not be answered in the public areas apart from locker rooms or outside. There are several public footpaths across the course on the 1st/18th, 2nd/17th and 3rd/16th holes, and access for local residents through gates by the 5th green/ 6th tee and the burn (stream) in front of the 7th green . There is also a maintenance road through the centre of the course that is used on occasions by walkers. Whilst the Access Code allows the public to use these paths, they are reminded to allow golfers to play their shot. However, this isn’t always the case. All golfers are reminded they should not play their shot unless it is safe to do so, ie. the group ahead, green keepers or members of the public are out of range. The beach is also in play on the 1st, 2nd, 3rd, 12th, 13th and 14th holes. Additional care should be taken when playing these holes. Our catering facilities are available to golfers and their partners / family. We cater for every taste and accommodate small and large groups either in our lounges or main dining room. To view our menus, please visit Clubhouse or Club Room. 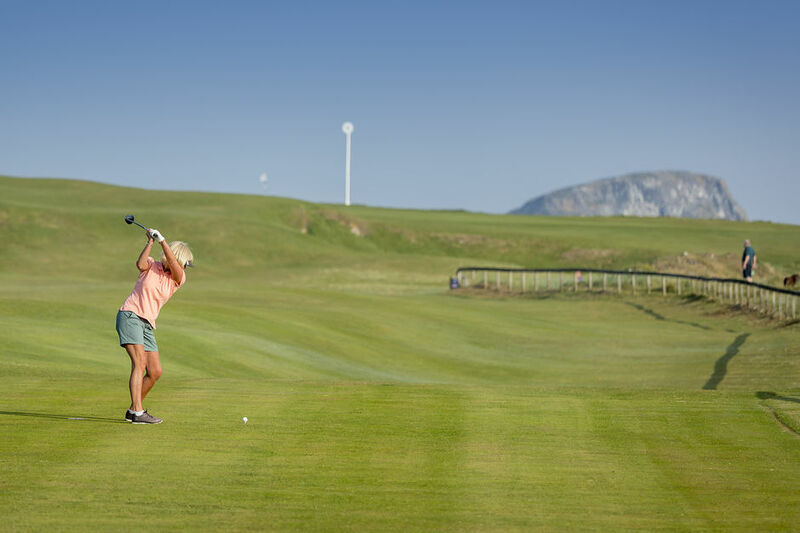 The partners of those playing golf are welcome to accompany their partners on the course and to use our clubhouse facilities on the day of play. Clubhouse dress policy applies. Please note that we do not allow golfers to take dogs on the course. Partners accompanying golfers on the course may not take dogs with them. The Club does not have a formal car park, so all golfers are required to park on the streets surrounding the course. Please allow sufficient time to find a parking space and arrive in in advance of your tee time. All golfers should report to the clubhouse in the first instance. If you believe you will be arriving late, please contact the Starters Office on 01620 892666 as soon as possible. We will do all we can to accommodate you although this may not always be possible. From St Andrews you should allow at least 3 hours. From Edinburgh Airport you should allow at least 1 hour 30 minutes from collecting your bags. From Glasgow Airport you should allow at least 2 hours 45 minutes from collecting your bags. From Royal Troon GC you should allow at least 2 hours 45 minutes. From Turnberry you should allow at least 3 hours 30 minutes. From Carnoustie you should allow at least 3 hours. We welcome all comments from our visitors. 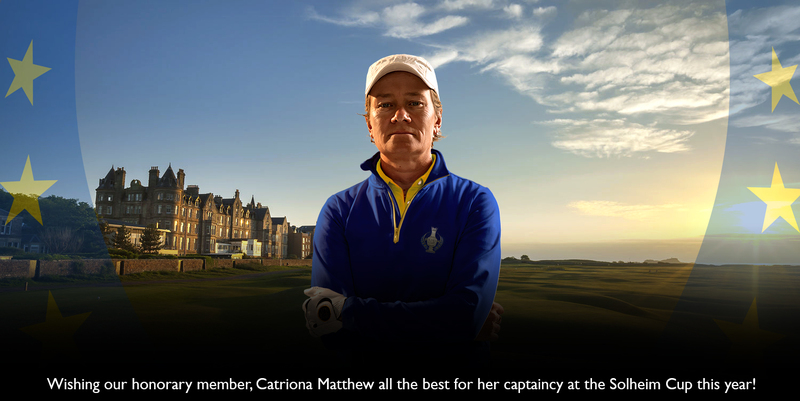 Simply email generalmanager @northberwickgolfclub.com.